The Immortal: NES-era RPG japes. When trying to write this article I had one big problem. How should I define this game? Is it a role-playing game? Sure it’s full of Orcs, wizards, magic spells and even a dragon but it has an important combat element and puzzle solving sections that test those little grey cells as well as any classic-era Lucasarts SCUM game. Then there are the adventure based parts that have you dodging traps and opening helpfully placed chests for money and even doing side quests to get important items. Well let’s just say The Immortal is a mix of all that and more â€¦ oh yeah and it’s hard, real hard. Originally programmed by Will Harvey (Marble Madness, Zany Golf) for the Apple II and released in 1990 it reached a far bigger audience here in the UK with the Megadrive and Amiga release in 1991 (The Apple II and NES never had much of a presence here) although there where six versions all told including conversions to the Atari ST, PC and even the NES. Each version is different from simple things like music and graphics to bigger changes like level design and item placement, for the purposes of today’s feature I’m going to focus on the Megadrive version as it is the best one in my humble opinion. Featuring seven levels of dungeon crawling action you start out having to rescue your mentor and master wizard Mordamir from the lowest level of what you’ll discover is the long lost City of Fountains. The story is told through talking to the odd friendly character that may or may not be telling the truth, reading notes and sleeping. Once per level you can find a straw bed that you can use to regain some of your health by going to sleep (not really a sensible option given all the wandering monsters but hey-ho) Whist asleep you have vivid dreams that reveal what Mordamir is doing in the City of Fountains to begin with and why he would risk travelling through the ruins as dangerous as they are. The city itself is stuffed with deadly traps, aggressive Orcs and rampaging Beastmen and enough giant worms to fill a monstrous manual. Every room has danger in it, often a wandering monster that will attack you on sight taking you to combat mode. The combat focuses on you and the monster in a one-on-one melee with two bars, one for health and one for fatigue. As you attack your fatigue rises making you slower and making it more likely that the monster will hurt you with its attacks, likewise the more the monster attacks you the slower it gets. The key is to dodge these attacks and wait for your opponents fatigue to reach maximum where upon you counter-attack and with the monster too tired to defend itself you can triumph with minimal health lost and a little reward in one of the many well animated death sequences. Death is a regular occurrence in The Immortal, from the monsters you slay in combat to your own fragile mortality. Dismemberment, scalping, electrocution, and petrifaction are all inflicted by you on the poor Orcs while you have over thirty unique death animations of your own, from monster inflicted death to trap related falls, immolation, disintegration and impalement. You did remember the amulet from stage one right? Hopefully all this text describing how you’re in constant danger will prepare you for just how hard this game is. It’s not unfairly hard like something like Rick Dangerous (ask your parents) the monsters can be slain once you perfected dodging and traps can be avoided and quests solved once you’ve figured out how to use the alcohol to dissolve the web or to grown the spores and kill the goblin king for example. As the game progresses from time to time you’ll use different transportation methods like a flying carpet to avoid a deadly trap filled floor or even ride an empty beer barrel through the cities sewers. Often it comes down to creeping about, taking it slow and watching for differently coloured tiles that are probably trapped or wandering monsters that will kill you and use up one of your three lives per level, thankfully there is a password system but it remembers what items you’ve used so make sure you collect every item you can and only use them when essential as some items you collect on stage one won’t have a use until the very end of the game. 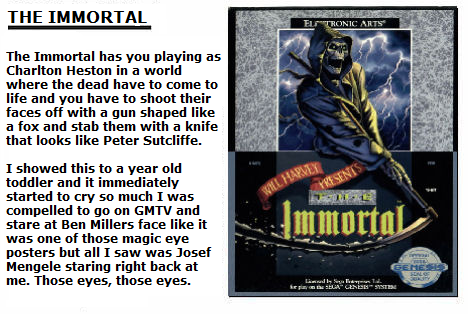 Playing The Immortal today is quite easy both the Amiga and PC versions are abandonware while the console versions are easy enough to find from any good retro retailer. Just be prepared for a big learning curve and be sure to have a notepad handy to copy down any clues you get and those all important passwords. This entry was posted in Perfekt Past, Retro on April 13, 2008 by Mark.